through Monday, 22-April-2019 3:00am GMT -05:00. During that time no exams can be registered or taken. We apologize for any inconvenience. Welcome to MEF's Professional Certification Exams. The MEFProCert is an MEF sponsored site providing registration, scheduling, and management for the MEF professional certification exams. Our exam management system enables individual and group registrations. So whether you are an individual scheduling an exam for yourself, a manager scheduling exams for a team, or an MEF Accredited Training Provider (MEF-ATP) scheduling exams for your students, you will find this system helpful. Once your exam registration order is complete, you will be directed to your "Exam Dashboard" where you can view your exam registration details. From the Exam Dashboard you can click on the "Orders" tab to view your orders and print receipts. For MEF-ATPs and managers, the Exam Dashboard keeps track of all your participants, in progress participants, exam groups, and orders. It allows you to make changes and displays examinee's scores following their exams. After taking an exam, the exam participants will receive an email with their score. 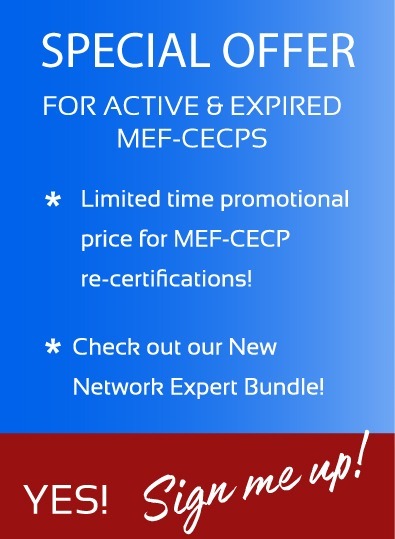 Those who pass the exam will be directed to update their personal MEF Certified Professionals Profile. This profile holds the exam participant's digital and printed copy of their personalized certificate and logos. The awarded participant is then listed on the MEF Certified Professionals page. How much does the MEF-NF exam cost? Your first exam attempt is $350 USD. If you don't pass after the first attempt, you may re-take the exam for $100 USD each. Should you fail the exam on the re-take, the next exam must be registered as a new exam and charged at the normal examination fee established by the MEF as of that time. Each exam participant is limited to no more than 4 total exam attempts consecutively in a 6 month period. If an exam is taken and not passed, the remaining re-take exams must be taken within 6 months after which time the special re-take price offer expires and a new exam must be registered at the full exam price. Each exam registration expires 1 year after purchase.